You know how sometimes in the design process, if something has a series of iterative improvements, those iterations are labeled “Mark [number]?” I’m not entirely sure Hasbro really gets that concept. We’ve seen the Recon Mk.II which was certainly an iteration of the Recon platform, but I don’t think many would say it really fixed any problems. Now we have the Scout Mk.II, daughter of Atticus Mk.II. So is this an improvement over the last model? I mean, I guess kinda, that is to say, it would be if it was in any way related to the prior Scout. But let’s not discuss that here, onto the review. The Scout Mk.II was released in 2019 as part of the N-Strike Elite series. It features a 4-round revolving cylinder and a prime bar sticking out the back. Actually, it’s mechanically identical to the Quadrant from the Accustrike line, just in a more triangular shell. I’m hesitant to call it “sleeker” because, while the lines do flow a little better than on the Quadrant, it adds a big section as a sort of angled fore-grip, if that made any kind of sense on a pistol. This, paired with the enclosed finger guard means that going for a tactical two-hand grip pretty much forces you to use the angled front section which again, just feels weird on a pistol. I suppose all of this isn’t a problem if you’re shooting one-handed like a true gentleman and officer, but that kind of went out of style after Crimea. The shell of the blaster does have an attachment rail, and a front sight sort of, but not really any rear sight. You know what they say, foresight is a blessing, but hindsight is just straight-up missing. The performance is ok, but it’s a pretty small blaster so you’re not gonna get a giant air chamber or a hard spring. It shoots fine, just don’t expect to kill any mockingbirds with it. What you absolutely can do is take shots at your younger siblings from across the room, and because it’s the same mechanically as the Quadrant, you can use the loud clack from priming the blaster as sort of psychological warfare. And as long as they’re an armed combatant, the Geneva Convention has nothing to say about it, so you’re good to go. The Scout Mk.II comes packaged with 4 Elite darts. I’ve fooled you. All of you. You thought I was just idly referencing the classic of American literature, To Kill A Mockingbird, but I’ve never actually read it, so ha. Joke’s on you? Anyway, books and international treaties aside, the Scout Mk.II is another entry into the ever-growing “it’s fine, if you want it, get it but you’re not really missing anything if you don’t” group or blasters. Who knows, maybe you like weird angled fore-grips on small pistols, in which case go right ahead and hold it that way while spewing hatred for the Deploy or whatever else people who are weird and wrong do these days. Sometimes, it is pretty clear when Hasbro, and more specifically Nerf, take criticisms to heart and fix problems with their products. The Recon Mk.II comes to mind. Other times, it seems more like they hear the criticism and offer a solution that isn’t exactly what people had in mind. One of the most widespread gripes about Nerf lately is their tendency to only paint one side of a blaster, leaving the design lopsided. I can’t help but feel they heard this and said “You don’t like how we paint our blasters? Well how about we just don’t?” Introducing the Surgefire. Ok, there’s more to it than that, but I just had to get it out of the way. On to the review! The Surgefire was released in 2018 as part of the core N-Strike Elite series. It operates on a pump-action revolver design that holds 15 darts in the cylinder. It’s hardly the first time we’ve seen these mechanics used in a blaster. 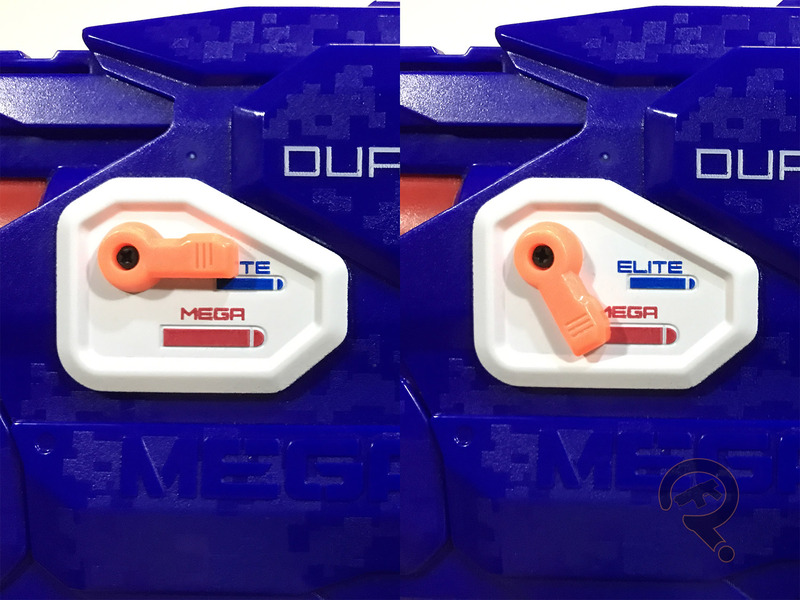 I suppose if you wanted to make the leap, you could say it’s an update to the Furyfire from the old Dart Tag line, though most people go with calling it the Elite version of the MEGA Rotofury. Both descriptions work. The shell is all new work and features one Nerf attachment rail along with some pretty interesting body detailing. The dark grey area just above the trigger assembly actually has the word “Elite” carved out of it revealing the blue plastic underneath through the letters. The use of dark blue text sunken into a dark grey panel does make it probably a little more subtle than they might have intended, but I do like that it suggests more intricate builds and sculpts to come. 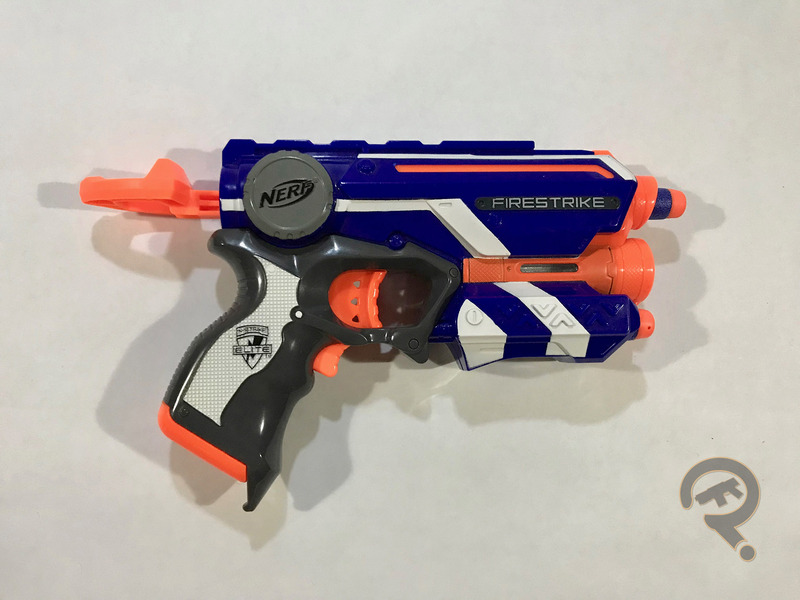 This also plays into the aforementioned lack of paint, save for the Nerf logo and the name “Surgefire” above the barrel. All variation in color is achieved via layering and inlaying separate pieces of plastic. It does lend itself to a higher quality feel to the blaster over something that might rely on paint or decals. Overall, the style is pulled off pretty well with just a couple drawbacks. First and foremost is in the pistol grip. Along the front seam where the two light grey halves meet, the screws are placed just far enough that the plastic can flex and produce a hard edge where it splits. At the best, its abrasive over time or if you’re holding onto the blaster tightly, and at worst it can actually pinch my fingers. It seems like adding another internal support wouldn’t have been too much trouble so it’s irksome to find it absent from the design. Ultimately it’s a minor complaint, and my second complaint is even more so. I’ll sum it up here: “By the goddess, that’s a lot of orange in one place.” Yes, it might have been nice to see some other colors on the front end, but it is what it is, I guess. Barring the issue with the grip, the blaster feels good in the hand. It’s stout but solid, giving it a sort of combat shotgun kind of feel. I do wish the cylinder could be loaded from the rear and that the ratchet on the cylinder could be indexed by hand a little easier, but ultimately it’s functional so I can’t really complain. For all its petty aesthetic and operational quirks, the Surgefire actually makes up for most of it in performance. Shots feel like they have more energy behind them than a lot of other recent blasters, flying far and hitting hard. You should really think about whether or not your younger sibling has earned it before you bust into their room and open fire with the Surgefire. Not as much as with, say, a Rival blaster, but more than just popping them in the head with a Jolt. The Surgefire comes packaged with the cylinder which snaps into the blaster and 15 Elite darts. The Surgefire was another purchase from one of my regular toy runs with my boy, Ethan, specifically to Target in this instance. Spurred on by my recent success with finding the Mediator and Kronos, I made a point of checking what was in stock more frequently in the following week or so. I actually found just about all the new releases I was looking for but settled on my 2 top choices, or else I feel I would have been subject to a sudden rush of ire at my unchecked spending. A surge of ire, if you will. A surge ‘f ire. There’s one thing blasters from the MEGA series all have in common and that’s being rather large. Being rather large and red. Yes. They all share relative largeness, redness, and radical devotion to the pope. Wait, hang on… scratch that last one. Large and red are still valid, though, and they certainly apply to this weeks blaster, the Twinshock. I guess I should tell you about it, then. Yeah alright, here goes. 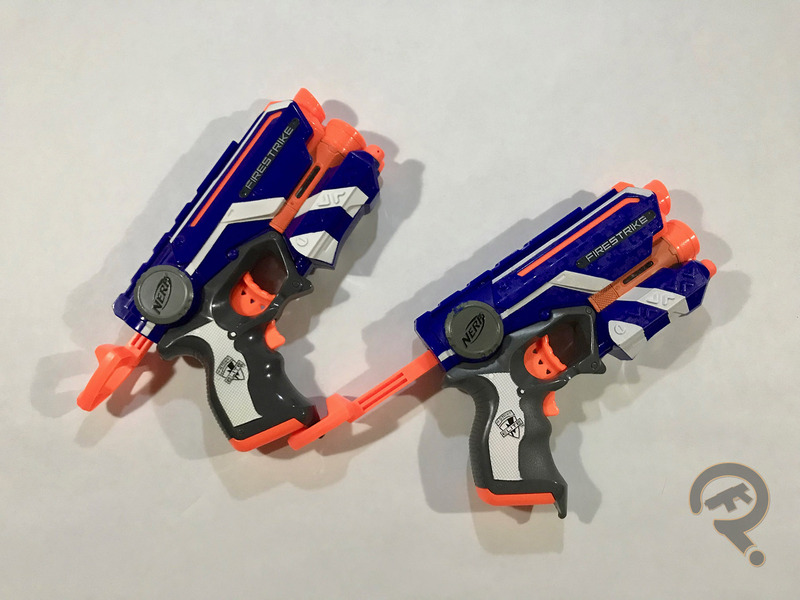 The Twinshock was released in 2017 as part of the MEGA series of blasters. 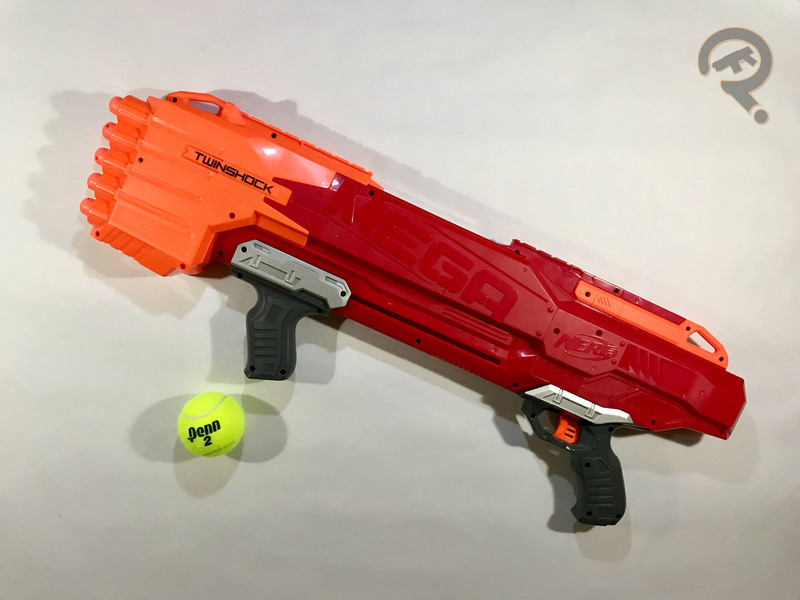 If you’ve read my review on the Roughcut 2×4, you should have a good idea of how this blaster works, because it’s functionally identical, just with 10 barrels instead of 8. In summary, it’s loaded from the muzzle, holds 10 rounds and for every rack of the priming handle, the staged trigger allows you to fire 2 darts either successively or simultaneously. Given the increased size of the projectile, it’s understandable that the power of the blaster has been accordingly bumped up. The Roughcut took advantage of a gear system to assist in priming two plungers with one motion. This gave it a slightly longer priming stroke than most other blasters. This is doubly true for the Twinshock which has an enormous stroke length but with comparatively low resistance, so there’s the trade-off. Now, I think it’s worth bringing up that the Twinshock, much in the same way as the Alien Menace Ravager before it, has a buttery smooth prime. It’s hard to describe how nice of a priming stroke it has so if you want to know what I’m talking about, you’ll just have to buy one and see, but it’s pretty great, so maybe do that. 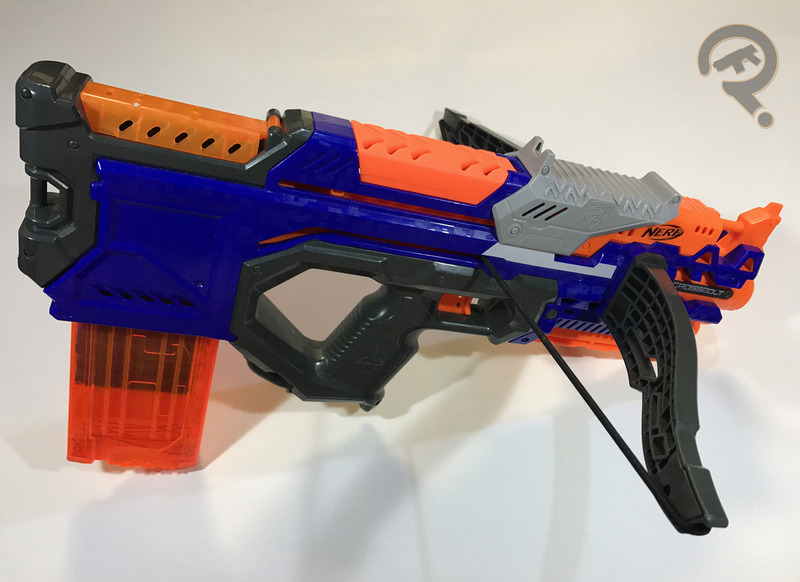 The exterior of the Twinshock is completely original and features two attachment rails on the top of the blaster. As mentioned before, it feels pretty hefty in hand and has some substantial bulk to it. The only real issue with that is that it is rather top heavy so make sure you have strong wrists if you’re planning on holding this blaster for a long time. I also wish it had a stock, or at least an attachment point for one, but I wish for a lot of things. The performance with the Twinshock is admirable. 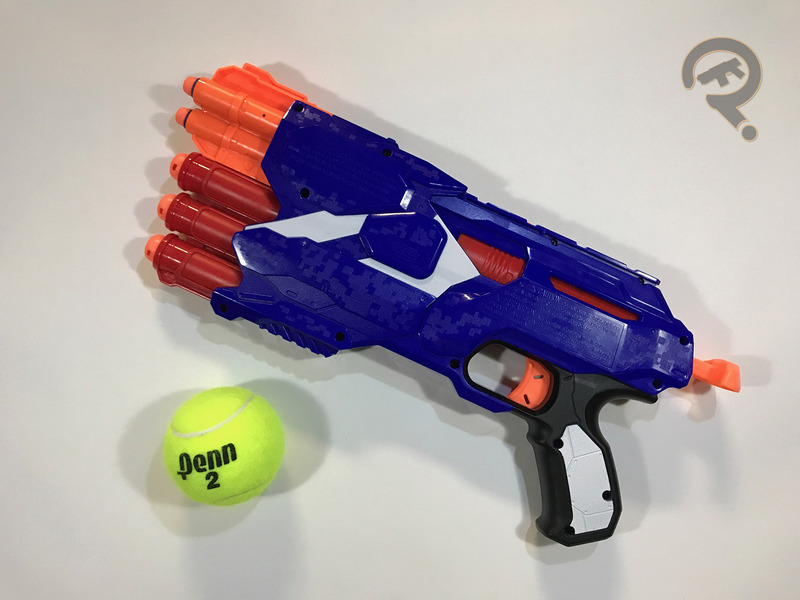 In line with other MEGA blasters, it hits hard and shoots far with the added perk of whistling darts that really frighten younger siblings when they hear them flying past their head. The capacity for double-tapping or shotgunning 2 darts is really what sets the Twinshock apart. The Twinshock comes packaged with 10 MEGA darts. I’m being fully serious about how great priming this blaster feels. If you don’t feel like buying one of these for yourself to experience it, find a friend who will and borrow theirs. Even if you’re some kind of weirdo who isn’t sold on that premise alone, its use as a weapon against younger siblings also cannot be understated. Variety is the spice of life or something. It keeps things interesting. But what if you’re in the middle of a foam conflict and you find yourself thinking, “Something new and/or exciting better happen right now or I’m gonna lose it”? The answer is simple. Use the selector switch. What does that mean? Well, I’ll tell you. 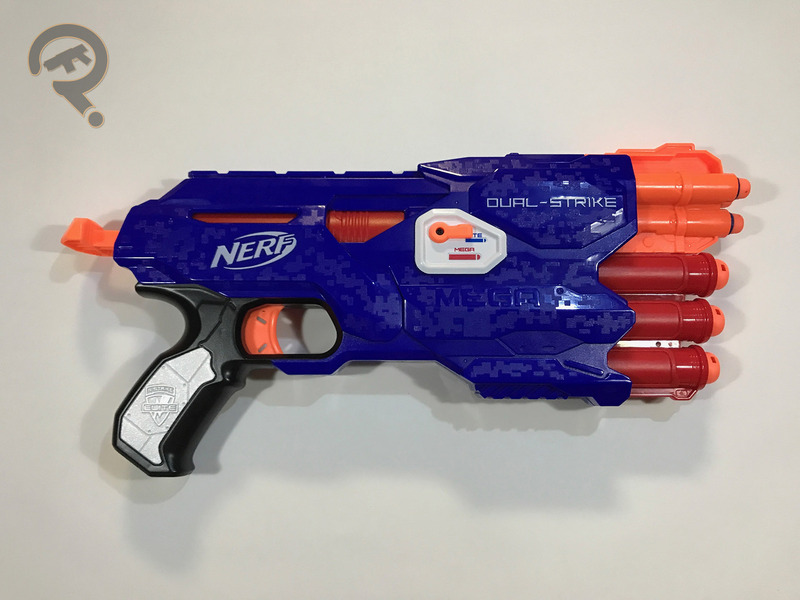 The Nerf Dual-Strike was released in 2016 as part of the N-Strike Elite series. The mechanics present in the Dual-Strike are mostly reused with one big exception that I will get into later. The blaster fires from one of two sets of three barrels linked via a smart AR system. The interesting part is that one set of barrels fires standard Elite darts while the other fires Mega darts. On top of that, you can manually control which type of ammo you want to use via the previously mentioned selector switch on the right side of the blaster. The switch is quite clearly labeled so you know which setting it’s on. It’s actually pretty impressive that the switch works as well as it does since it’s not uncommon for more complex smart AR setups to want to eject darts prematurely if there’s even the slightest increase in air pressure. Since I’ve had the DS, I haven’t experienced any air interference from one barrel group to the other, so kudos to Nerf on the engineering behind that. Now on the other hand, I do have a few mostly subjective complaints about the exterior of the blaster. I’m not a fan of the style of priming handle on the DS. I realize it’s simple and just works, but I really don’t like how it sticks way out the back of the blaster when it’s primed. There are other Nerf blasters that use this same method of priming and I don’t like it on any of them either, all the way back to the Nitefinder. I just wish there had been a more elegant solution because I know it’s possible. Also, while the grip is mostly fine, the notch just below the trigger where your middle finger is supposed to sit is way too narrow for my hand, so instead of my finger getting a secure, comfortable hold on the blaster, I have one finger sitting on a random raised edge. It would have been better if this had either been moved down slightly or just removed entirely. Again, mostly just my personal preferences, but I figure you must at least slightly value my opinions since you’re most of the way through this post, and if you are, I appreciate that. There’s also a single attachment rail on the top of the blaster. As far as functionality is concerned, at it’s most basic, the DS is a more complicated than usual 6-shot pistol which is pretty oddly proportioned to boot. The Elite darts fly reasonably far and hit as hard as you’d expect a blaster in the Elite series to hit. 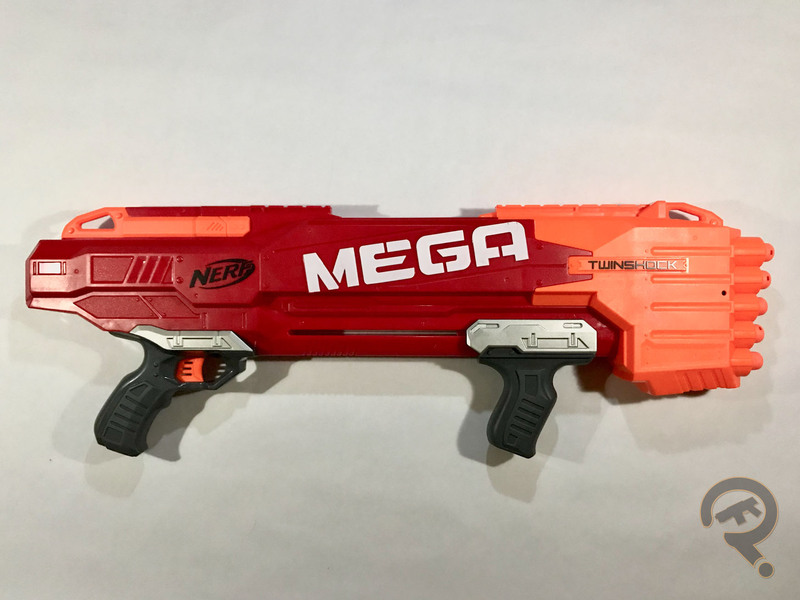 The Mega darts, however, don’t have the power behind them that they would have in a dedicated Mega blaster, so shots leave just a little to be desired. Overall, I’d say the DS is best suited to indoor use for those times when you can’t decide just how mean you want to be to your younger siblings. The Dual-Strike comes packaged with 3 Elite darts and 3 Mega darts. The Dual-Strike is one of those kind of hard to place blasters. It felt more like a proof of concept rather than a product made to fill a niche in the market. That being said, it’s plenty of fun for just messing around. I just see the idea behind it having more potential than the final product we got in the end. Add that to all this switch and DS talk and I feel like I’m writing up a Nintendo press release. I’ve mentioned before that the vast majority of the bow and crossbow type Nerf blasters fall under the Rebelle series. Every so often, however, one of the other lines will get a bow of some sort, and that is the case for this week’s blaster, the Crossbolt. This blaster in particular also fits into the category of blasters that I greatly enjoy but is fairly widely disliked by other Nerfers. I can maybe understand some of the more common complaints, but not enough for it to ruin the blaster for me. I’ll get to that in a little bit. Let’s take a look at the blaster. The Crossbolt was released in 2015 as part of the N-Strike Elite series. 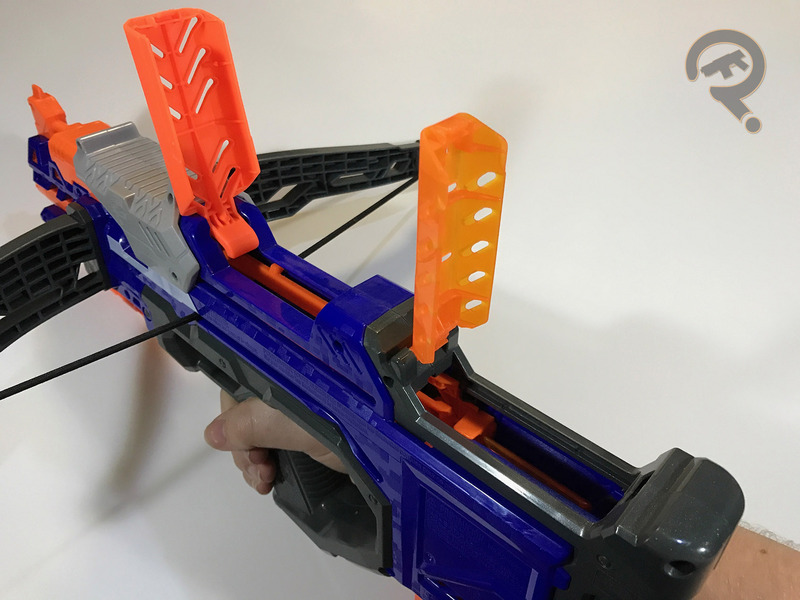 It is a magazine-fed, elastic powered crossbow type blaster, which makes it very unique among Elite blasters as there are no other crossbows or “stringer” blasters in the line. 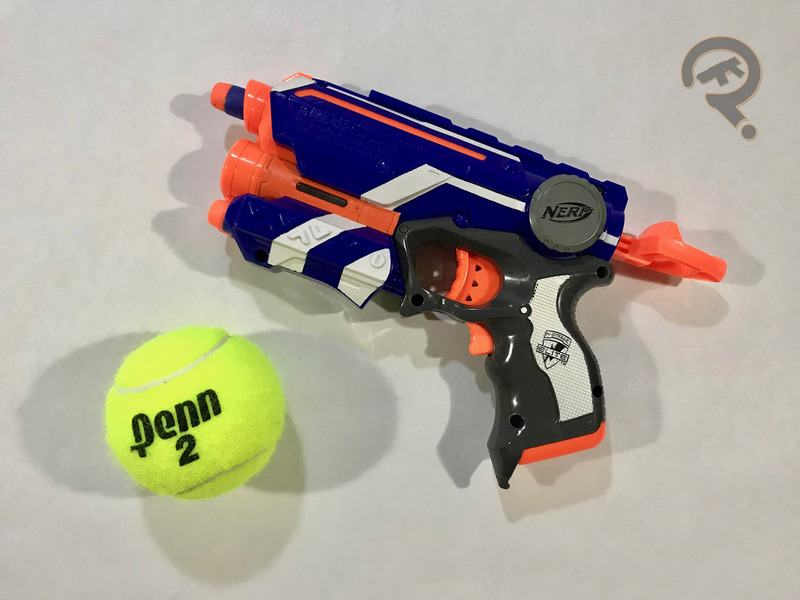 Additionally, it is one of the only two blasters to feature a bullpup configuration (firing mechanism behind the trigger) along with the Rayven. Aside from this, the blaster is entirely original. The main 3 of the aforementioned complaints about the Crossbolt focus around the ergonomics of the blaster. 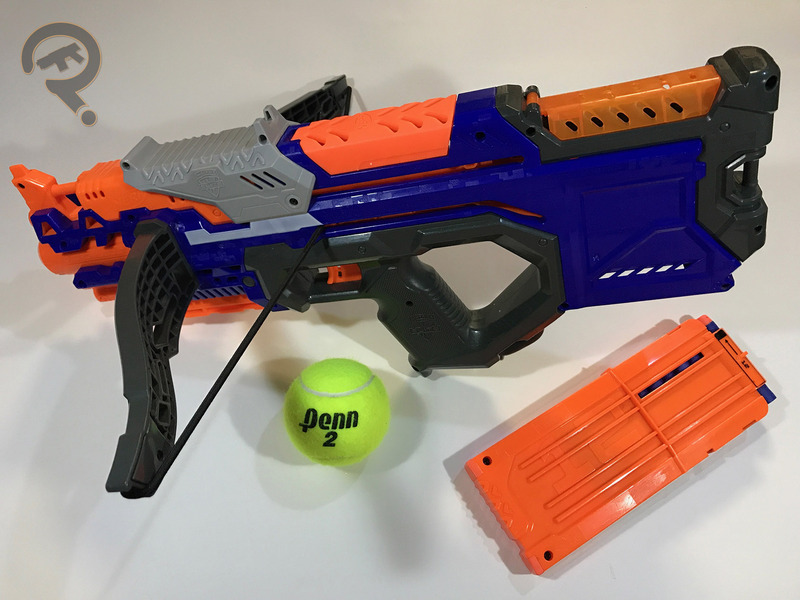 The first issue concerns the bow arms protruding into the path one’s hand might take traveling from a forward grip to the priming slide at the top of the blaster. While this is admittedly a hurdle few other blasters have, a simple twist of the firing-hand wrist solves the problem quite nicely. This is also achieved without any of the straight up goofy flailing and fumbling I’ve seen some people do while trying to illustrate that plastic is solid and hands can’t go through it. The second issue it the magazine release. This, I can understand a little more because it is true that the placement and style of the magazine release make it fairly easy to accidentally bump the mag so that it falls out of the blaster. I’ve even found that the release button doesn’t necessarily need to be pressed to cause the magazine to come loose. The conclusion I came to was that the back of the blaster is not, in fact, a stock and that the blaster is not intended to be shouldered, a theory i felt was supported by how hard it is to line up the sights if it’s shouldered. Could Nerf have designed it better to avoid this problem? Yes, but it’s really the kind of problem you learn to avoid pretty quickly, so it’s still not a deal breaker. Lastly, a lot of grown-up Nerfers like myself (but not including myself in this instance) complained that the dimensions of the thumb-hole grip were cramped and left parts of the blaster digging into their hands and/or wrists. This, I absolutely don’t get. Maybe I have weirdly perfect Crossbolt hands. Either way, I’ve had zero problems with the grip and actually find it quite comfortable for such a compact blaster. 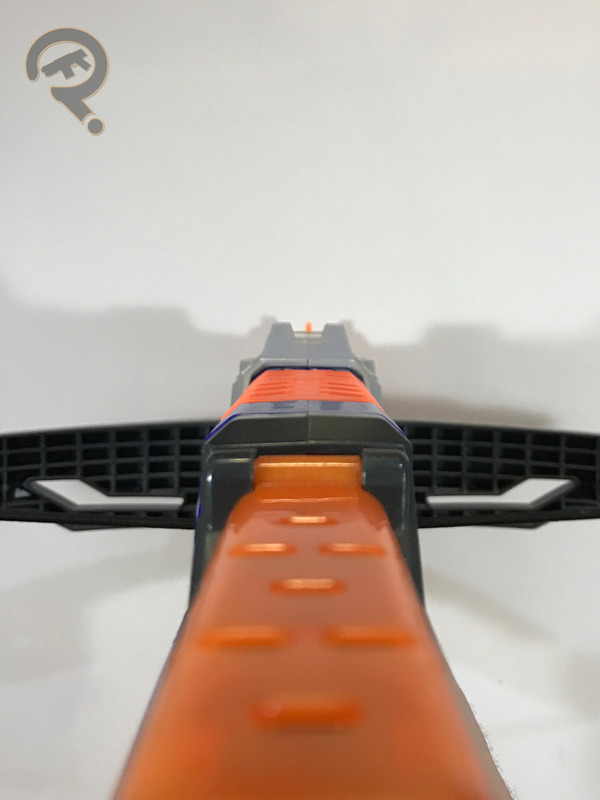 As I said, the Crossbolt features some fairly basic sights along the top as well as not one, but two jam access doors due to the slightly more complex internal structure of the blaster. There is also an attachment rail on the underside of the barrel for accessories. As with other stringer blasters, firing the Crossbolt is very quiet compared to an air plunger blaster, although priming each shot does make a good bit of noise as there are plenty of catches and latches along the stroke. The string in the Crossbolt seems to have a noticeable amount more tension than with other stringer blasters and this definitely shows in performance as darts fly far and fast, hitting with good, solid impact, making this more of an outdoor blaster. The Crossbolt comes packaged with a 12-round magazine and 12 Elite darts. I felt it was important to highlight the fact that this is a really fun, unique blaster because I remember, after it came out, seeing reviews with goofballs smacking their hands into the bow arms intentionally in an attempt to make their point like a cheesy infomercial. I wouldn’t say it’s my favorite blaster, but it is entertaining in its own right, and entirely undeserving of the bad wrap it’s gotten over the years.